This first batch is part of the Planning phase in a three-step process I refer to as Planning, Selling, and Engaging. 1. Don’t Kid Yourself. Understand that mandated value and mission statements do not drive behavior in themselves, nor do written policy manuals. And the more they’re created in a vacuum and then announced, the more they’ll be ignored by the general population. Instead, engage people in defining the desired culture and key success criteria; assess the current state; identify the gaps between the desired and current state; and explore methods for influencing behavior, many of which are outlined in the remaining tips. 2. Ask “Why are we here?”- Ask: What are we trying to achieve? For whom? When? In what order? What benefit are we aiming for? What’s the benefit of the benefit? Why should anyone care about this? These are the root questions that will formulate the communication plan. 3. 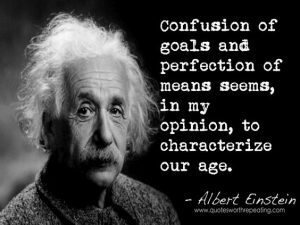 Be Narrow-Minded – Albert Einstein famously said, “Confusion of goals and perfection of means seem, in my opinion, to characterize our age.” It also characterizes most implementations. Never confuse goals with solutions. Always start with a clear purpose—a singular call to action. Drive alignment around those goals, and the measurable objectives that will support them. Select just a few metrics and targets so as to narrow people’s focus and not dilute the effort. Aim for one major goal at a time if possible. Author Patrick Lencioni declared in his book Silos, Politics, and Turf Wars, that a singular call to action—a rallying cry—is vital for breaking down silos and unifying your organization. 5. Check Your Pulse – Before embarking on a journey, it’s a good idea to get a health check. This is true for organizations as well. The goal is to assess whether the organization’s behaviors are in line with its stated intent. There are diagnostic tools, surveys, and other assessment methods that can reveal—by region, department, management level, and other demographics—how well the organization mirrors the key success factors and stated values put forth by its leadership.